Condition "from now on, if." Qualifications or limitations annexed to an agreement by which it may be continued, altered, or rendered of no effect upon the performance or non-performance of something, or the happening or non-happening of an uncertain event. If the event must happen before the agreement begins to operate, the qualification is called a "condition precedent"; if afterward, a "condition subsequent." A condition may be attached to any contract or legal act. The various conditions known to Roman and common law may be divided as follows: (1) positive, i.e., the happening of some event which may or may not happen; (2) negative, i.e., the non-happening of such an event; (3) authoritative, i.e., dependent on the power of the party in whose favor the obligation is contracted; (4) dependent on the party binding himself with the obligation; (5) casual, i.e., dependent on an accident, or on the act of persons in no way controlled by either of the parties to the contract; (6) mutual, i.e., dependent on the acts of both parties; (7) mixed, i.e., dependent on the act of one of the parties and a third person. The condition may be either expressed or implied, and it may be lawful or unlawful. The law of conditions is well developed in the Jewish law-books. All these classes of conditions were known to the Jewish law. Nevertheless the classification of the subject-matter must differ somewhat from that of the other systems of law. Express conditions are created by the use of one of three formulas: "im" (if); "me'akshaw im" (from now on, if); and "'al menat" (on condition that). The condition "if" differs materially from the other two. The latter are simpler, and not subject to the same rules that must be observed in order to create a valid condition with the form "if." The first consideration refers, therefore, to the condition "if." There are four principal rules to be observed in the creation of a condition with the word "if." (1) The condition must be "double" ("tenai kaful"); that is, it must be expressed in a positive as well as a negative form. R. Meïr derived this rule from Num. xxxii. 29, 30: "And Moses said to them, 'If the children of Gad and the children of Reuben will pass with you over Jordan, . . . then ye shall give them the land of Gilead for a possession: but if they will not pass over with you, . . . they shall have possessions among you in the land of Canaan'" (see Mishnah Ḳid. iii. 4). The following example is given by Maimonides ("Yad," Ishut, vi. 3): "If a man says to a woman, 'If thou givest me two hundred zuzim thou art betrothed to me by this denarius [coin], but if thou dost not give them to me thou art not betrothed'; and after having expressed this condition he gives her the denarius, the condition is a valid one, and she is 'betrothed on condition.' If thereafter she gives him the two hundred zuzim she is betrothed absolutely; and if she does not give them to him, she is not betrothed." Some of the later geonim ruled that conditions need not be "doubled" except in cases of conditions annexed to betrothal or divorce, and that in ordinary contracts referring to money matters this form of expressing the condition doubly is unnecessary.Maimonides dissents from this (Ishut, vi. 14), and his opinion is the adopted law. If the condition is not properly expressed in its double form it is void, and the contract is unaffected by it. Thus, if, in the case above, the man had merely said, "If thou givest me two hundred zuzim thou art betrothed to me by this denarius," and had omitted the clause, "if thou dost not give them to me thou art not betrothed"; and had then given her the coin, the condition would have been void, and she would have been betrothed to him absolutely (Ishut, vi. 5). (2) The double condition must be so expressed that the positive form precedes the negative. This is shown in the above example. If the man had put the negative form first, thus: "If thou dost not give me the two hundred zuzim thou are not betrothed, but if thou givest them to me thou art betrothed with this denarius," and if he then gave her the coin, she would have been betrothed without condition (Ishut, vi. 1; Giṭ. 75b). (3) The condition must precede the act, or the conclusion of the contract. Maimonides illustrates it thus: "If the man says to the woman, 'Thou art betrothed to me by this coin,' and gives her the coin; and then expresses the condition, saying, 'If thou wilt give me two hundred zuzim thou art betrothed; but if not, thou art not betrothed,' the condition is void, because the legal act of betrothal was complete before the condition was expressed" (Ishut, vi. 4). 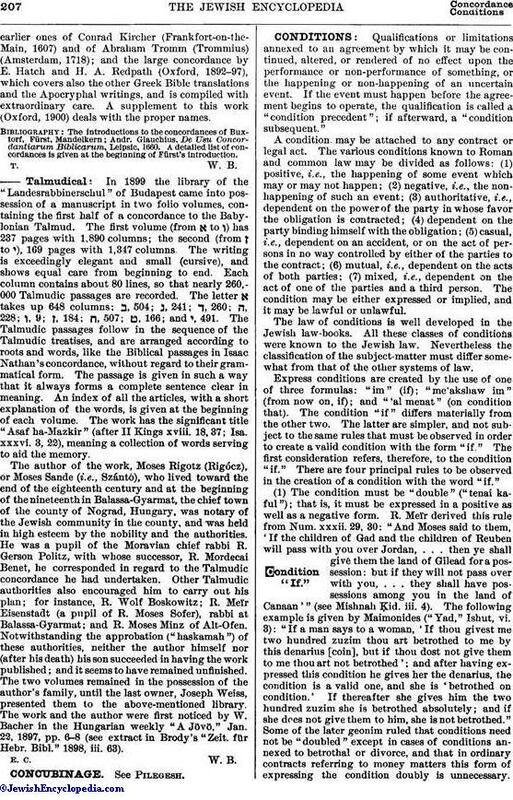 In taking the view that the act itself may not precede the expression of the condition, Maimonides follows the literal meaning of the Mishnah (B. M. vii. 11): "And every condition which is preceded by the act is void." Other authorities go even further, and maintain that the substance of the contract may not even be expressed before the condition is expressed, or else the condition is void (Maggid Mishneh to "Yad," Ishut, vi. 4). Thus the contract and the condition in the following case are well expressed: "If you do this I will give you that; but if you do not do this I will not give you that." But if a party says, "I will give you this if you do that," the condition is void. (4) The condition must be one possible of fulfilment. If the condition of the contract is that the party shall climb into heaven, or walk through the sea, or swallow a reed a hundred yards long, the condition is void, and the contract is complete without condition (B. M. 94a). The condition created by the words "me'akshaw im" (from now on, if) differs in many important respects from the condition "if." The latter is, in fact, a condition precedent, and the former a quasi condition subsequent. Where the condition is that a certain thing shall be done "if" something else is done, the condition must be fulfilled before the contract to do the thing can be enforced; whereas in a condition subsequent, the contract is immediately effective, but may be ended by the performance or non-performance of the condition at some future time. In the Jewish law this is accomplished by use of the words "from now on, if." The distinction between these two cases is thus expressed by Maimonides (Ishut, vi. 15, 16): "If one betroths a woman 'on condition,' she is betrothed from the moment the condition is fulfilled, and not from the time of the actual ceremony of betrothal. For example, if he says to a woman, 'If I give thee two hundred zuzim during this year thou art betrothed to me by this denarius, and if I do not give them to thee thou art not betrothed,' and gives her the denarius in the month of Nisan, and the two hundred zuzim in the month of Elul, she is betrothed from Elul. Therefore if another betroths her before the condition imposed by the first man is fulfilled, she is betrothed to the second." And this is also the law in cases of divorce and of money matters. The divorce is absolute or the sale or gift perfected at the time when the condition is fulfilled. All this is true only if, in imposing the condition, he did not say "from now on." If, however, he said, "Thou art betrothed unto me by this denarius from now on if I give thee two hundred zuzim," and he eventually gives her the two hundred zuzim, she is betrothed from the time of the ceremony of betrothal, even though the condition was not fulfilled until after some time. Therefore if a second man betroths her before the fulfilment of the condition, her betrothal to the latter is void. And this is also the law in cases of divorce and of money matters (Ḳid. 60a; Giṭ. 74a). Three of the above four rules that must be observed in creating conditions with the word "if" need not be observed when the words "from now on, if" are used. The only one in force in this case is that the condition must not be impossible of fulfilment (Ishut, vi. 17). But the Shulḥan 'Aruk states that there is a difference of opinion on this point among the authorities, some holding that even when the form "from now on, if" is used, all the rules must be observed (Eben ha-'Ezer, 38, 3). The form "'al menat" (on condition that) is in all respects similar, in its legal effect, to the form "from now on, if" (Ishut, vi. 17; Giṭ. 74a). Conditions may be implied from the nature of the contract and from its terms. Thus if a contract is reduced to writing and contains a date, the question as to when it is to go into effect is determined thereby (Ket. 2b). The date in the contract is equivalent to the use of the form "me'akshaw." If a contract is entered into for a specific reason, as where one sells a piece of ground because he urgently needs the money, and the reason fails, as when the need for the sum of money is no longer pressing, the contract may be rescinded, because it is an implied condition of the contract that it is to be considered null and void if the reason that caused its consummation no longer exists (ib. 97a). It is necessary, however, that this reason be clearly stated at the time the contract is made, or otherwise the implied condition is not presumed to exist, for the maxim of the law is that "words which are in the heart are no words" (Ḳid. 49b). This rule applies only to contracts concerning real estate, for in contracts concerning movable property the conditions, if any, must be expressed according to the rules of law governing the making of conditions (gloss to Ḥoshen Mishpaṭ, 207, 3). There are some acts which are subject to conditions,because it is presumed that all men are familiar with them. They need not be expressed in any way; they are absolutely presumptions of law. Thus where a man on his sick-bed transfers his entire estate to another, the law presumes that it was done in contemplation of death. The condition is implied that if he dies it shall be a valid transfer, but if he recovers it shall be void. It is not to be presumed that a man would have given away his entire estate if he expected to recover from his illness (Mishnah B. B. ix. 6; see also Ḥoshen Mishpaṭ, 246, 1; "Yad," Zekiyah, vi. 1). Unlawful conditions are void. Such are conditions that are contrary to the precepts of the law (Mak. 3b). For instance, if a man marries a woman on condition that he shall not live with her as her husband, such a condition is absolutely void. But if he stipulates that he shall not provide her with food and clothing, his condition is a valid one (Eben ha-'Ezer, 38, 5). 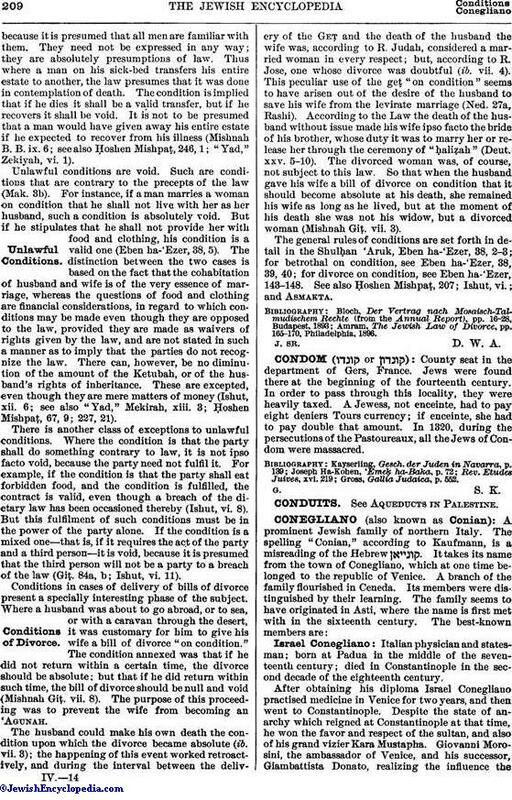 The distinction between the two cases is based on the fact that the cohabitation of husband and wife is of the very essence of marriage, whereas the questions of food and clothing are financial considerations, in regard to which conditions may be made even though they are opposed to the law, provided they are made as waivers of rights given by the law, and are not stated in such a manner as to imply that the parties do not recognize the law. There can, however, be no diminution of the amount of the Ketubah, or of the husband's rights of inheritance. These are excepted, even though they are mere matters of money (Ishut, xii. 6; see also "Yad," Mekirah, xiii. 3; Ḥoshen Mishpaṭ, 67, 9; 227, 21). There is another class of exceptions to unlawful conditions. Where the condition is that the party shall do something contrary to law, it is not ipso facto void, because the party need not fulfil it. For example, if the condition is that the party shall eat forbidden food, and the condition is fulfilled, the contract is valid, even though a breach of the dietary law has been occasioned thereby (Ishut, vi. 8). But this fulfilment of such conditions must be in the power of the party alone. If the condition is a mixed one—that is, if it requires the act of the party and a third person—it is void, because it is presumed that the third person will not be a party to a breach of the law (Giṭ. 84a, b; Ishut, vi. 11). Conditions in cases of delivery of bills of divorce present a specially interesting phase of the subject. Where a husband was about to go abroad, or to sea, or with a caravan through the desert, it was customary for him to give his wife a bill of divorce "on condition." The condition annexed was that if he did not return within a certain time, the divorce should be absolute; but that if he did return within such time, the bill of divorce should be null and void (Mishnah Giṭ. vii. 8). The purpose of this proceeding was to prevent the wife from becoming an 'Agunah. The husband could make his own death the condition upon which the divorce became absolute (ib. vii. 3); the happening of this event worked retroactively, and during the interval between the delivery of the Geṭ and the death of the husband the wife was, according to R. Judah, considered a married woman in every respect; but, according to R. Jose, one whose divorce was doubtful (ib. vii. 4). This peculiar use of the geṭ "on condition" seems to have arisen out of the desire of the husband to save his wife from the levirate marriage (Ned. 27a, Rashi). According to the Law the death of the husband without issue made his wife ipso facto the bride of his brother, whose duty it was to marry her or release her through the ceremony of "ḥaliẓah" (Deut. xxv. 5-10). The divorced woman was, of course, not subject to this law. So that when the husband gave his wife a bill of divorce on condition that it should become absolute at his death, she remained his wife as long as he lived, but at the moment of his death she was not his widow, but a divorced woman (Mishnah Giṭ. vii. 3). 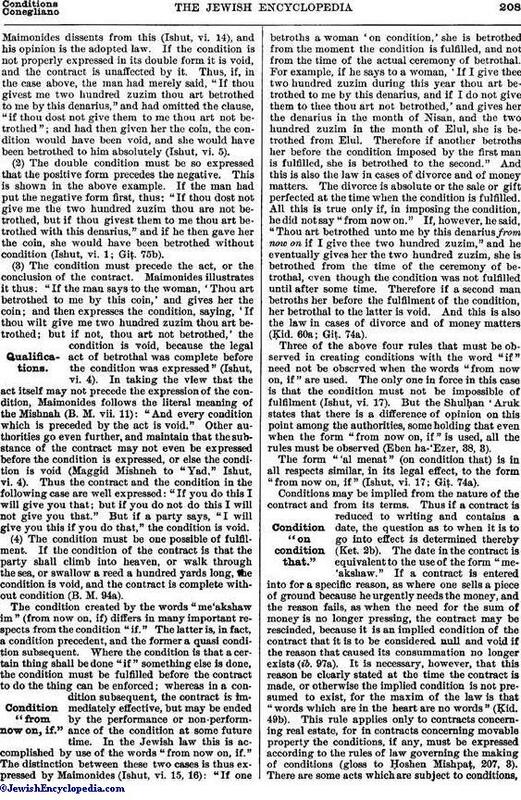 The general rules of conditions are set forth in detail in the Shulḥan 'Aruk, Eben ha-'Ezer, 38, 2-3; for betrothal on condition, see Eben ha-'Ezer, 38, 39, 40; for divorce on condition, see Eben ha-'Ezer, 143-148. See also Ḥoshen Mishpa2ṭ 207; Ishut, vi. ; and Asmakta. Amram, The Jewish Law of Divorce, pp. 165-170, Philadelphia, 1896.